Liuzzi put up the best battle he could but it was Hamilton who secured a place in the second round, lining up a match with none other than Michael Schumacher. That is days ahead of us, though, and for now, we turn our attention to this first round pairing. 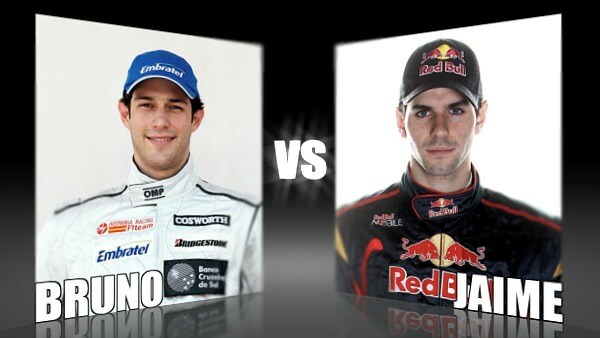 We've got the brand new (and apparently replaceable) Bruno Senna facing off against the other Spaniard, Jaime Alguersuari. Bruno Senna is certainly popular, as his recent expulsion from the driving seat at HRT showed. Even so, there are some that doubt whether he has the skills for the sport and is just trading on the famous name. With a fun teammate in Chandhok, the pair have done all sorts in the name of marketing, including dressing up as firemen and stroking dolphins. Each endeavour undertaken in fine spirit by Mr Senna. You'd be forgiven for thinking Alguersuari is a little on the anonymous side, but don't forget his rather incredible Twitter account. No other Twitter user could claim to use more capital letters or more exclamation marks than this young chap. He is also very happy to post Twitpics of himself, taking part in training sessions, meeting up with people, and of course, putting his DJ skills to good use - most recently in Ibiza. We call him Tim, but will Jaime get your vote today?